Six year-old Charlie Anne Cox likes the colour pink, giggling with friends, and watching movies. 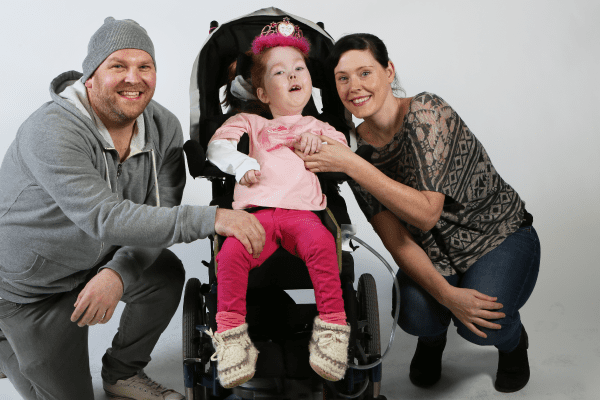 Her infectious smile can often be found in the hallways of Canuck Place, where she has been a regular guest since being diagnosed with a genetic disease called Spinal Muscular Atrophy Type 1 when she was 6 months old. There’s never a shortage of activities for Charlie Anne while she’s staying at the house. She enjoys peering into the large fish tank, setting off light and musical shows in the Snoozelan room, and attending school with the Canuck Place teacher. For her parents, a trip to Canuck Place can either be a time of fun, worry-free family time together, or it can be a place where they can take a much needed break. Canuck Place also provides Matt and Cherie with emotional support, where parents can connect with other families who can understand exactly what they’re going through. Charlie Anne and her parents are featured in the Let Your Light Shine project.